In last week’s Tombstone Tuesday I wrote about Emma’s husband John Kreiselmeyer, who died in 1887 and is buried in row 5 in Zion Schumm’s cemetery. It seems unusual that Emma and her father share a tombstone, making it look like, at first glance, that they were probably husband and wife. And that Emma’s maiden name was Kreiselmeyer. You might look at the stone and think he was old enough to be her father. Well, he was her father! One might think that Emma would share a tombstone with her husband John Kreiselmeyer or have her own separate tombstone. Emma and her father John Seaman died about a year apart and that may have something to do with the it. Perhaps money was an issue. To make matters even more confusing, John’s wife, and Emma’s mother, Anna Maria Seaman, is buried at another cemetery. 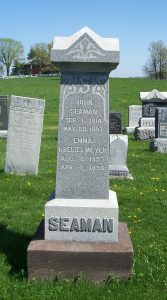 Find a Grave.com indicates that Emma was John Seaman’s wife , but the records indicate that Emma was really the daughter of John and Anna Maria Seaman, and the wife of John Kreiselmeyer. According to Zion Schumm’s records, Emma Seaman was born 7 August 1857, the daughter of John and Anna Maria Seaman. Emma was baptized 27 April 1862, with Jakob Helle and his wife Maria Barbara serving as her sponsors. I have been unable to locate the Seaman family in 1860. Zion Schumm’s records indicate that Emma was born in Warren County, Ohio, in 1857, so they probably moved to Schumm sometime before Emma’s baptism in 1862. Emma’s sister Maria was also baptized at Zion Schumm in April of 1862 and Maria is recorded as having died at Schumm in 1862. When they did settle in this area they lived near the Kreiselmeyers. Emma Seaman married her neighbor John Kreiselmeyer sometime between 1870 and 1880, but I could not find a record of their marriage. The Kreiselmeyers and Seamans lived near each other and both families attended Zion Schumm, so I assumed John and Emma would have married at Zion Schumm, but evidently not. Their marriage is not recorded there. Emma’s husband John Kreiselmeyer died 20 July 1887. He was 32 years old and is buried in row 5 of Zion Schumm Cemetery. Emma may have lived with her parents after her husband John’s death. Her mother Anna Maria Seaman died 12 January 1894 and is buried in Greenbrier Cemetery, Van Wert County. Anna Maria was 75 years old, and her age agrees with the census records. 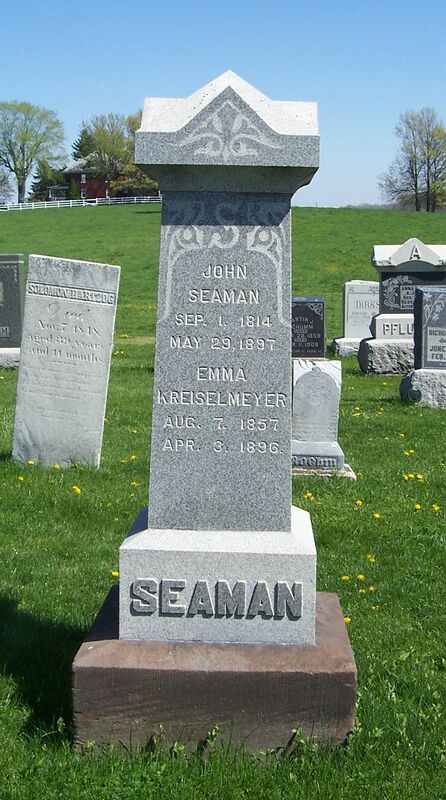 Her tombstone indicates she was married to John Seaman. Greenbrier Cemetery is north of Schumm. Why was she buried at Greenbrier and not Schumm? Perhaps she was not a member of Zion Schumm. Emma (Seaman) Kreiselmeyer died two years later. Zion Schumm’s death/burial records identify her very clearly: Emma Kreiselmeyer, born Seemann [Seaman], wife of Mr. Johann Kreiselmeyer, born 7 August 1857 in Warren County, Ohio, died of cancer on 4 April 1896, at the age of 38 years, 7 months, and 27 days. She was buried on 7 April. Her funeral text was 1 Cor.15: 55-57. Emma’s death is also recorded in Van Wert County Probate: Emma Kreiselmeyer, widow, age 38 years, 7 months, and 27 days, died of cancer on 3 April 1896. 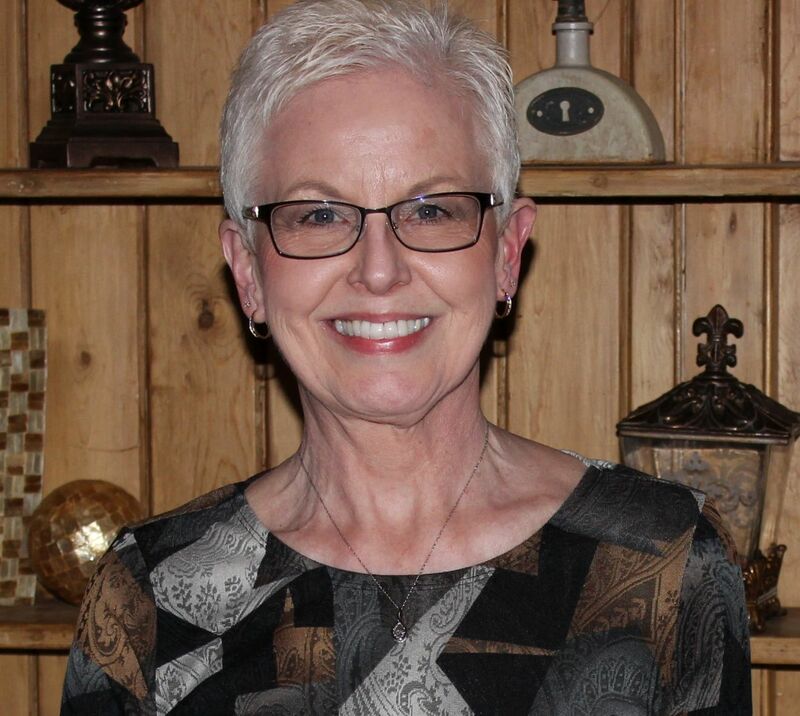 Born in the U.S., her residence was Schumm, where she died. She was a housekeeper. This record shows her death date one day earlier that the church records, but the date agrees with her tombstone. It appears that John and Emma Kreiselmeyer did not have any children. Find a Grave, Emma Kreiselmeyer Seaman, memorial no. 34047025, Zion Lutheran Cemetery, Schumm, Van Wert County, Ohio. 1870 U.S. Census, Willshire, Van Wert, Ohio, p.437 [stamped], dwelling 105, family 106, John Seaman; Ancestry.com ( https://search.ancestry.com/search/db.aspx?htx=List&dbid=7163&offerid=0%3a7858%3a0 : viewed 1 Oct 2018). 1880 U.S. Census, Willshire, Van Wert, Ohio, ED 154, p.449A [stamped], family 113, John Kreiselmyer; Ancestry.com (https://search.ancestry.com/search/db.aspx?htx=List&dbid=6742&offerid=0%3a7858%3a0 : viewed 1 Oct 2018). Find a Grave, Anna M. Seaman, memorial no. 22579270, Greenbriar Cemetery, Glenmore, Van Wert County, Ohio. “Ohio County Death Records, 1840-2001,” database with images, FamilySearch ( https://www.familysearch.org/ark:/61903/3:1:S3HY-6722-8J?i=532&cc=2128172 : viewed 8 Oct 2018), Anna M. Seaman, 12 Jan 1894; Van Wert Co. Deaths, Vol. 2, p.191, no. 8; FHL microfilm 1015858. “Ohio County Death Records, 1840-2001,” database with images, FamilySearch ( https://www.familysearch.org/ark:/61903/3:1:S3HY-672V-GL?i=460&cc=2128172 : viewed 1 Oct 2018), Emma Kreiselmeyer, 3 Apr 1896; Van Wert Co. Deaths, Vol. 2, p.97, no. 11; FHL microfilm 1015858. ( https://www.familysearch.org/ark:/61903/3:1:S3HY-672L-S5?i=536&cc=2128172 : viewed 1 Oct 2018), John Seaman, 29 May 1897; Van Wert County Deaths, Vol. 2, p.195, no. 8; FHL microfilm 1015858.